By Joseph M. Yetto, Jr., M.D., Frederic C. Jewett, III, D.O., Mickaila J. Johnston, M.D. We present a 9-year-old girl with a history significant for 8 months of left wrist pain, which ultimately led to the diagnosis of stage IV diffuse large B-cell lymphoma (DLBCL). Initial fluorine 18 fluorodeoxyglucose (FDG) positron emission tomography-computed tomography (PET-CT) imaging revealed hypermetabolic activity in the left wrist, as well as in right inguinal and left axillary lymphadenopathy. The patient underwent chemotherapy and completed the last cycle of R-CHOP (chemotherapy regimen consisting of rituximab, cyclophosphamide, hydroxydaunorubicin, vincristine [Oncovin], and prednisone). A follow-up FDG PET-CT to determine treatment response revealed complete response in the noted hypermetabolic areas. However, there was a new area of focal hypermetabolic activity centered in the appendix (Figure 1). Appendicitis refers to inflammation of the vermiform appendix. Patients often present with fever, nausea, vomiting, anorexia, leukocytosis, and initially periumbilical pain, which eventually localizes to the right lower quadrant as the appendix becomes increasingly inflamed and irritates the adjacent abdominal wall. Ultrasound and CT are the two most common imaging modalities for suspected acute appendicitis, demonstrating a dilated, fluid-filled appendix with surrounding inflammatory changes. With ultrasound, lack of ionizing radiation makes it the preferred initial method for appendicitis evaluation in children and pregnant patients. While FDG PET-CT should not be used for evaluation of suspected acute appendicitis, FDG PET-CT may occasionally suggest the diagnosis when it is an incidental finding or is unsuspected, such as in patients with a fever of unknown origin. On FDG PET-CT, acute appendicitis presents as focal hypermetabolic activity overlying an enlarged and dilated appendix with periappendiceal fat stranding.4 Typhlitis, a life-threating necrotizing enterocolitis involving the ileocecal region predominantly seen in neutropenic patients, may demonstrate similar increased FDG avidity in the region of the appendix with involvement of the adjacent bowel. Mucinous cystadenocarcinoma of the appendix is one of the more common noncarcinoid malignant neoplasms of the appendix. It is a high-grade tumor that can metastasize to the regional lymph nodes, liver and lungs. Mucinous neoplasms can rupture, resulting in gelatinous material accumulating within the peritoneal space, or pseudomyxoma peritonei.6 High-grade neoplasms preferentially take up FDG and, thus, are hypermetabolic on FDG PET-CT.7 The most common clinical presentation of this tumor is superimposed acute appendicitis. The most common metastases to the appendix are from neoplasms of the breast, colon, and female reproductive organs.10 Metastases to the appendix can present as acute appendicitis due to luminal obstruction. Metastatic disease demonstrates similar FDG uptake variability based on the type of primary tumor and the degree of differentiation of the metastases. FDG PET-CT findings were highly suspicious for acute appendicitis even in this patient with known stage IV DLBCL. At the time of interpretation, the ordering provider was contacted and informed of the findings. The patient was then sent to the local emergency department where she was found to have an acute abdomen on physical exam and subsequently underwent an uncomplicated laparoscopic appendectomy, which revealed acute suppurative transmural appendicitis on pathology examination. FDG PET-CT is commonly used in the evaluation of neoplastic processes; however, FDG avidity is not tumor-specific, as a myriad of infectious and inflammatory processes may show increased metabolic activity as well. 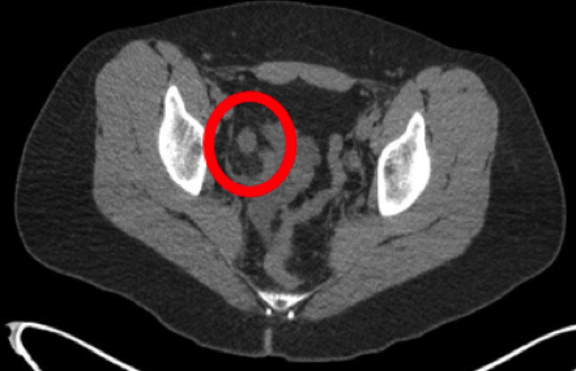 This case of acute appendicitis illustrates that the interpreter of PET-CT images must consider that FDG activity may reflect pathology unrelated to the primary indication for the exam. Kamel EM, Thumshirn M, Truninger K, et al. Significance of incidental 18F-FDG accumulations in the gastrointestinal tract in PET/CT: correlation with endoscopic and histopathologic results. J Nucl Med 2004;45(11):1804-1810. Israel O, Yefremov N, Bar-Shalom R, et al. PET/CT detection of unexpected gastrointestinal foci of 18F-FDG uptake: incidence, localization patterns, and clinical significance. J Nucl Med 2005;46(5):758-762. Park HL, Yoo IeR, Choi EK, et al. 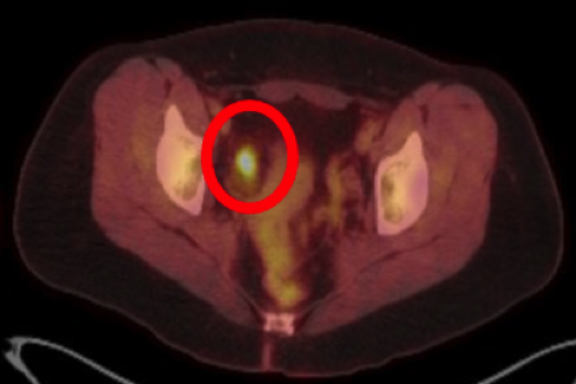 Acute appendicitis secondary to metastatic small cell lung cancer incidentally found on F-18 FDG PET/CT. Clin Nucl Med 2012;37(1):e19-21. Moghadam-Kia S, Nawaz A, Newberg A, et al. Utility of 18F-FDG-PET/CT imaging in the diagnosis of appendicitis. Hell J Nucl Med 2009;12(3):281-282. Perlman SB, Hall BS, Reichelderfer M. PET/CT imaging of inflammatory bowel disease. Semin Nucl Med 2013;43(6):420-426. Pickhardt PF, Levy AD, Rohrmann CA, et al. Primary neoplasms of the appendix: radiologic spectrum of disease with pathologic correlation. RadioGraphics 2003;23:645-662. Passot G, Glehen O, Pellet O, et al. Pseudomyxoma peritonei: role of 18F-FDG PET in preoperative evaluation of pathological grade and potential for complete cytoreduction. Eur J Surg Oncol 2010;36(3):315-323. Tsukamoto N, Kojima M, Hasegawa M, et al. The usefulness of (18)F-fluorodeoxyglucose positron emission tomography ((18)F-FDG-PET) and a comparison of (18)F-FDG-PET with (67)gallium scintigraphy in the evaluation of lymphoma: relation to histologic subtypes based on the World Health Organization classification. Cancer 2007;110(3):652-659. Ganeshan D, Bhosale P, Yang T, Kundra V. Imaging features of carcinoid tumors of the gastrointestinal tract. AJR Am J Roentgenol 2013;201(4):773-786. Kim HC, Yang DM, Jin W, Kim GY, Choi SI. Metastasis to the appendix from a hepatocellular carcinoma manifesting as acute appendicitis: CT findings. Br J Radiol 2008;81(967):e194-196. Yetto JM, Jewett FC, Johnston MJ. Hypermetabolic Appendiceal Activity on PET-CT. J Am Osteopath Coll Radiol. 2016;5(3):21-13. Joseph M. Yetto, Jr., M.D., Frederic C. Jewett, III, D.O., Mickaila J. Johnston, M.D. Drs. Yetto, Jewett, and Johnston are with the Department of Radiology, Naval Medical Center San Diego, San Diego, CA.